LARCHMONT, N.Y. (January 13, 2012) – Sailors captured the breeze from a creative angle during a video challenge at the Larchmont Yacht Club and Storm Trysail Foundation 2011 Intercollegiate Offshore Regatta (IOR), which took place over Columbus Day Weekend. During the two-day event, 30 HD Flip video cameras, donated to the Foundation by Storm Trysail Club members Rick Lyall and Barry Gold, were made available so that each sailing team had the opportunity to document as much action as possible onboard their boats and dockside before and after racing as well as during social events. This week, Villanova University, with sophomore Scott Barnhill (Baltimore, Md.) serving as video editor, was declared the winner of the video challenge (click to view video) and will receive a $1,500 donation made out to its sailing team. “We’re in a big fundraising stage for our team, so this a fantastic boost for us,” said Barnhill, adding that it was Villanova’s first time attending the event and that it certainly lived up to its reputation as the world’s largest, if not most exciting, college regatta. 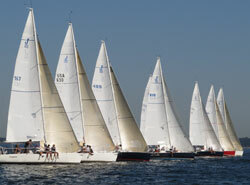 Over 400 collegiate sailors from across the country raced on the placid waters of Long Island Sound off Larchmont, N.Y. They sailed on 47 offshore boats, which were lent for the weekend by private owners. The boats ranged in size from 35 to 44 feet. Once the regatta had concluded, the footage, which totaled over 50 hours, was uploaded to a server, and each team was challenged to turn the collective work into a short video that would best capture the atmosphere of the event. “The video that Villanova submitted not only met the criteria of the contest, but it was a superior effort that will serve to show what this regatta is all about and help the Storm Trysail Foundation and Larchmont Yacht Club build interest in the event,” said IOR Regatta Chairman Adam Loory. The regatta was free to the participants and the boat owners thanks to the financial support of the Storm Trysail Foundation and sponsorship from Rolex, Vineyard Vines, Caithness Energy, Safe Flight Instruments, UK-Halsey Sailmakers, Coke, Heineken and Gill. Larchmont Yacht Club provided free moorings for over 30 visiting boats.